This centenary year of Benjamin Britten’s birth has occasioned many commemorative performances and new assessments of his work. Looking back at his achievements, one must be struck with how much theatrical work is there, especially as many concert-goers may not know Britten for much more than The Young Person’s Guide to the Orchestra and perhaps the interludes from Peter Grimes. In Boston we have been fortunate that this centenary has inspired the production of several of his small scale theatrical works—The Turn of the Screw (1954) was presented by NEC Opera in January and Owen Wingrave (1971) was presented by the BU College of Fine Arts in February. Now, the third of Britten’s church parables, The Prodigal Son (1968), is being produced by Intermezzo at the First Church in Cambridge. The first performance was Friday night, and it will be repeated on Saturday. Britten’s church parables are a theatrical form uniquely his own. When the composer and his partner, the tenor Peter Pears, toured Asia in 1957, Britten was struck especially by Balinese gamelan and by Japanese Noh plays. The gamelan drove the creation of Tadzio’s music in Death in Venice; Noh plays provided Britten with the impetus to create the church parables. In a manner similar to Noh, the parables are highly stylized: the characters are universal types rather than individuals, the plots archetypes with ancient themes. The church parables all have Christian themes, as Britten saw connections between the cultural role of Noh and those of medieval mystery plays. The first parable, Curlew River, was an adaptation of a Noh play which Britten and his librettist William Plomer relocated to England and gave a Christian theme. The next two Britten and Plomer drew directly from Biblical sources—The Burning Fiery Furnace from the Old Testament and The Prodigal Son from the New—with some liberties are taken in the dramatization. The parables are written for a small, diverse orchestra. For The Prodigal Son there is an ensemble of viola, alto flute/piccolo, trumpet, horn, harp, organ, bass and percussion. Importantly, they are “church” parables not only because of their content, but also because they are written for the acoustic and ritual qualities of a church. The sparse and divergent timbres of the orchestra function differently in the reverberant acoustic of a sanctuary than they would in a dryer concert hall; and the characteristic pacing and dramatic structures reside more comfortably in a space devoted to religious ceremony than they could on a proscenium stage. The casts are small—in The Prodigal Son, there are only four principal parts, plus a male chorus of eight and a small children’s chorus. In all three of the parables, the voices are exclusively male. The story of The Prodigal Son is the one you remember: a Father (bass-baritone Paul Guttry) has a Younger Son (tenor Matthew DiBattista) who decides to ask for his inheritance and goes off see the world. The Younger Son lives unwisely, loses his fortune and returns home; the Father forgives him and celebrates his return, much to the dismay of the Elder Son (baritone David McFerrin). Britten and Plomer have added an addition character, The Tempter (tenor Jason McStoots), who initially convinces the Younger Son to go out into the world, and then guides him to his ruin. The action unfolds in the sanctuary of First Church on a platform, in front of a beautiful backdrop painted by set designer William Fregosi, depicting a harvest time scene with an ancient naivete. 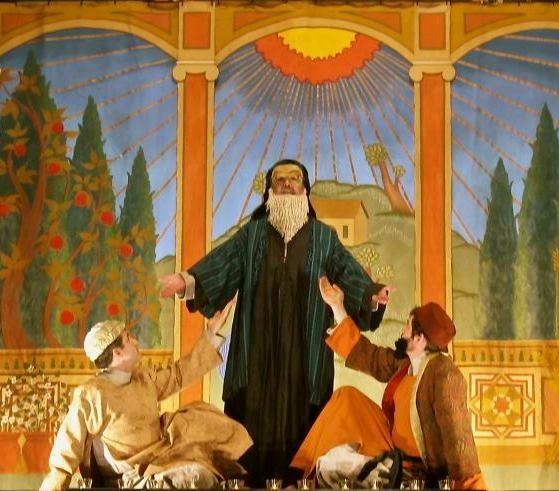 The stage director, Kirsten Cairns, says that Islamic art was a significant influence on Britten and his original director Colin Graham—but to my eye the look of the set and costumes (by Rebecca Butler) suggested a Renaissance Italy with some Semitic touches. Your reaction to any of the church parables may depend upon your ability to enjoy theater that is ceremonial rather than conventionally dramatic, and the setting is critical to your reception. My initial exposure to them was through recordings, where I found their pacing tiring and the sparseness of the orchestration unsatisfying. In their intended environment though, they glow and radiate. The pacing is no longer merely slow, it is solemn; the lightness of the orchestral texture becomes shimmering that surrounds you as it echoes in the reverberant space. A similar effect is created by the lighting designer, Jeff Adelberg, who uses the existing overhead lighting in the church with a constellation of candle-lights and limited additional lighting to create an environment that never feels “theatrical,” but which produces several distinct worlds of illumination. The production begins with prologue of chant, sung by monks in the near-dark. It terminates in an amen which is immediately echoed and then twisted into an extended ululation by the Tempter before the story proper begins. The acting is mannered and stylized, with gestures used to amplify and comment upon on the sung texts. To emphasize the archetypal nature of characters, three of the performers’ faces are obscured—the Tempter by a brilliant red mask of flames, the Father by a ropy white beard and eye mask, and the Elder Son by a black chin-beard. Much of the music is a kind of sung recitative, with solo instruments echoing and countering the lines sung by the actors. The action proceeds from stage picture to stage picture, many quite stunning. The musical setting of the language is expert, as you would expect from Britten at this point in his life—the rhythm of the music only distorts the speech-rhythm when emotion causes a word to jump into prominence. The chorus portrays the Father’s servants and the Younger Son’s partners in debauchery with a gestural choreography, and they function as the set, structuring the space through which the principals move. Intermezzo’s production is vivid and impassioned and sounds thoroughly idiomatic. Intermezzo has had experience with this genre before, performing Curlew River in 2006. (The Prodigal Son had been planned to follow but was delayed by the recession of 2008.) The principal singers were wonderfully well-cast. The principal voices are paired—the Father is a bass-baritone and the Eldest Son a baritone, while both the Younger Son and Tempter are tenors—but the vocal qualities of the singers were quite different from each other, matching their characters. Guttry’s Father had a reassuring and warming tone, comforting, filling the space; McFerrin was harder, edgier, fully capable of commanding the action to halt with his displeasure near the end of the piece. The contrast between McStoots as the Tempter and DiBattista as the Younger Son was even greater; McStoots brought a sensuality and suavity to the Tempter that couldn’t be more different from DiBattista’s serious and intensely focused tone (he has a bit of Peter Pears in his voice). Of course, much of the credit here has to be given to Britten, who crafted each character’s vocal line to match his personality: the Father reassures, the Eldest Son barks, the Tempter sways and the Younger Son struggles. The Tempter really does steal the show here, not the first time the devil has dominated a story in which he is ultimately defeated. From his hijacking of “amen”, to his strutting around in a red robe with black sash while corrupting the Younger Son, to his final lines after exiting the Tempter character, McStoots is clearly having the most fun of everyone on stage. I have but one criticism of the piece: it has perhaps a bit too much solemnity for its own good. The Younger Son never enjoys his debauchery. The dance performed upon his return has a crabbed and severe quality to it, despite the amount of percussion brought in to liven it up. The dance is also the one place where the gestural language threatens to become pantomime, an attempt to add energy to the scene. But given the narrow emotional boundaries of this world, it still makes a deep impression; one is left with the sympathy and generosity of the Father, the sense that one can be allowed back into one’s community no matter how badly one has failed. The Prodigal Son concludes with the monks’ exiting the church, again chanting as they did for their prologue. This time the final amen is intoned, and then echoes into nothingness; the voice of the Tempter is gone. There was a long and profound silence; ultimately someone began clapping, but it might have felt better simply to walk out into the night. Intermezzo’s performance of Britten’s The Prodigal Son is not to be missed, and the performance tonight is the only one remaining. Jason McStoots outshone, not that Matthew di Battista, Paul Guttry, and David McFerrin did not give it their all as well; they were excellent, as were the on-stage and off singers. The staging, a pre-Raphaelite-like tripartite scene, complemented by what one knowledgeable art historian said were genuine 14th-century stage movements, was clever and very effective, as was the costuming. How rewarding to hear children newly re-introduced in the choir of the Trinity Church in the City of Boston … The only thing missing were the harlots, but Britten left then out. Peccato. This comment was first posted on another review before this one was posted, just to get up some notice for this fine performance before people made final plans for Saturday night. BMInt publisher Lee Eiseman graciously amended then appended it to this review as soon as it was posted. I don’t think either did much good, however; according to the impresario of Intermezzo, attendance on Saturday night was good, though less than on Friday. A real shame. This additional note is to lament the fragility of performance of such a gem from such a polished group, the ephemeral quality of too much of what we are privileged to hear in Boston, the inability to hear such performances again, although a video was made. The Britten Foundation is to be commended for graciously supporting the issuing of this superb performance, but surely music lovers should not have to wait until 2051 to be able to see the video without copyright restrictions? Can we hear from anyone else who was in the audience, for either night?